Award-winning psychologist Peter Warr explores why some people at work are happier or unhappier than others. He evaluates different approaches to the definition and assessment of happiness, and combines environmental and person-based themes to explain differences in people's experience. A framework of key job characteristics is linked to an account of primary mental processes, and those are set within a summary of demographic, cultural, and occupational patterns. Consequences of happiness or unhappiness for individuals and groups are also reviewed, as is recent literature on unemployment and retirement. Although primarily focusing on job situations, the book shows that processes of happiness are similar across settings of all kinds. It provides a uniquely comprehensive assessment of research published across the world. 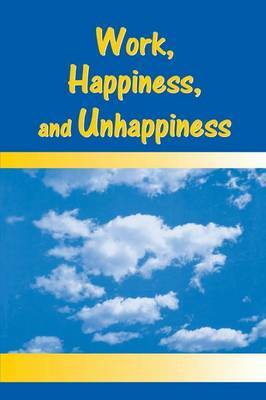 Initial chapters explore the several meanings of happiness and the ways in which those have been measured by psychologists. The construct includes pleasure, satisfaction and subjective well-being, and unhappiness has been studied in terms of dissatisfaction, strain, anxiety, and depression. The impacts of principal environmental features on these experiences are reviewed through an analogy with vitamins in relation to physical health-beneficial only up to a point. However, environmental effects are not fixed. Influences on happiness from within the person are examined in terms of principal thinking patterns, personality styles, and cultural backgrounds. Differences are explored between groups (men and women, older and younger people, employees who are full-time and part-time, and so on), and processes of person-environment fit are placed within an overall framework which emphasizes the impact of variations in personal salience. The book is written primarily for academic readers, including senior undergraduates, graduate students, teachers, and researchers in fields of Industrial/Organizational Psychology, Management, Human Resources, and Labor Studies. However, the topic's centrality in many professions makes it important also to a wider readership.